Advanced play is simply doing the basics well. Every player wants crisp volleys, powerful groundstrokes and a killer serve, but we often leave the basics in the dust when pursuing bigger and better things. Balance is the key to movement transition, directional change, speed, power and efficiency in sport. No matter how fast you can run, how high you can jump, how strong or athletic you are, you will need improved balance to be able to make these skills work for you. What is at the center of balance in tennis? Ready position–So, what’s the big deal? I bet you’ve never read much on the ready position. It’s not an exciting subject, but one that will improve your game tremendously. The ready position is the most important posture in tennis and yet the most disregarded and poorly executed form in the game. What we don’t really get is that the ready position takes practice and discipline, just like a forehand, backhand, volley or serve. It’s a form, a posture and a discipline and it allows us to transition from one shot to the next. When we learn it as a beginner, it’s kind of awkward and uncomfortable and doesn’t seem that important. Besides, we are ready to run around, hit the ball and have some fun, right? Every single shot hit in a point sequence originates from the ready position (except the serve) and every grip originates from it, too When it breaks down, so do your strokes and so does your movement. What is the perfect ready position? We all need to be as athletic as possible to play good tennis and your ready position will either allow or hinder athletic movement to the ball. A good ready position involves specific placement of the feet, legs, torso, arms, hands, head and eyes. This position centers your weight and makes athletic movement possible. ►The feet need to be spaced appropriately with the toes on your feet pointing forward (not out). Now when you bend your knees your weight will be forward on the front of your feet and you’ll be ready to spring. If your toes point outward and you bend your knees, your weight goes to the mid-foot or back on the heels. You cannot move from this position and besides, you just look bad. ►Ankles, knew and hips are flexed and ready to spring. ►The arms, hands and racket are extended forward and in neutral placement for quick reactions to incoming shots. For one-handed backhand players, the non-dominant hand is placed higher on the throat of the racket for stability in holding the racket head up. Many two-handed players hold the non-dominant hand closer to the hitting hand on the grip in ready position as a time saver on grip changes. ►The head is still and looking forward and the eyes are looking over the tip of the racket. ►The positions above are extremely important for volley position and return of serve. 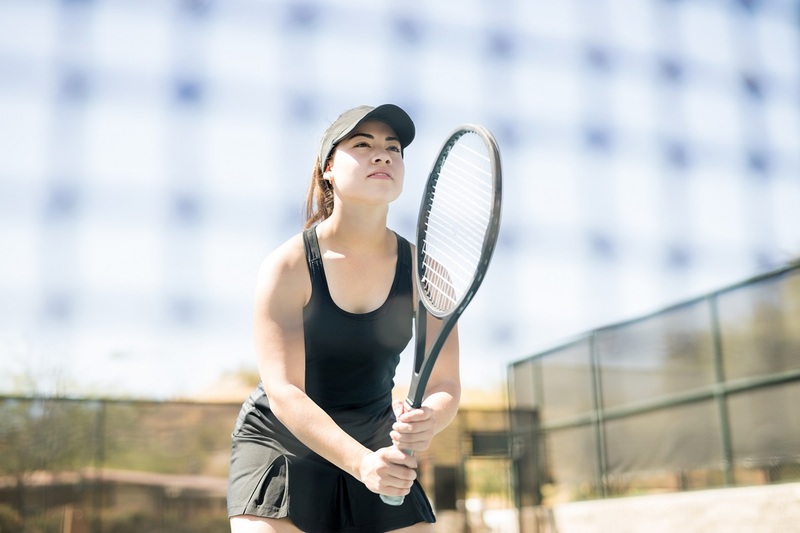 ►When playing groundstrokes in a baseline point, the elbows may bend more and the arms may be in closer to the body to allow for quicker lower body movement. The non-dominant arm and hand are 99 percent responsible for holding the racket out in the ready position. Most players use their dominant hand and arm to hold the racket out. Because of how our arm hangs from the shoulder, plus how we grip the racket, keeping the racket in the center line of your body and the tip facing forward is awkward. If you are right-handed, the racket tip naturally wants to point off in a left direction and if you are left-handed, it wants to point in a right direction. If you use your non-dominant hand and arm to hold the racket out, then it is simple to hold the tip out straight. This frees up the hitting hand and arm to hold a loose grip for quick grip changes, quick turns to the right and left and allows the racket to be in a fixed and neutral position to receive balls. The first footwork movement to a ball is the most important. When your feet are spaced beneath the shoulders and the toes are forward, an ankle and knee bend set your weight forward on your feet for quick response. The ready position is the start position for all volleys, overheads and serve returns. It also needs to be an automatic re-set position after you have hit a ball. You may not even know how you prepare for the ready position. Try this … stand up now and see if you can realistically create your tennis ready position. If you do, and you are correct with it, you are in the top two percent of tennis players with this skill. A great ready position will set you free! ►Forehand and forehand return: These days, the “set” is the way to go for the first move on a topspin forehand. 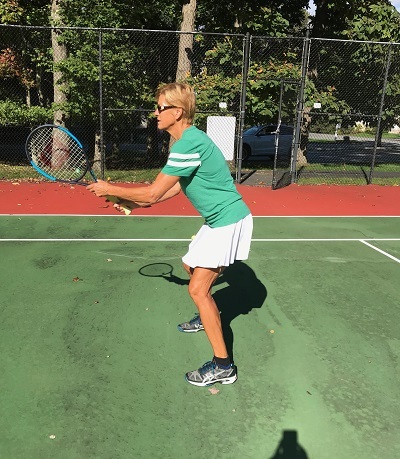 From your neutral ready position, the knees, hips, torso, arms, hands and racket make a unit turn to the right or left, depending upon which hand you use. Both hands stay on the racket in order to get the shoulders fully turned. Your lower body is preparing by rotating the hips and preparing a weight transfer for a quick first step. If your ready position is good, then the set can be done quickly and efficiently giving the player more time to respond. ►Backhand and backhand return: If you use a one-handed backhand, the ready position is critical. There is a substantial grip change that needs to be made if the ball is hit to, or served to, the backhand. Most players will stand to return serve and stand or move during a point using a forehand grip. When the ball comes to a backhand, the non-dominant arm and hand will be holding the racket out and the hitting hand will have a loose grip. The turn is initiated by a lower body turn and the non-dominant arm and hand drawing the racket into position. The loose grip with the dominant hand floats into correct position. If you use a two-handed backhand, the neutral ready position will allow for a quick turn to the backhand side and allow for any grip changes. Typically, the non-dominant hand will be in backhand position for the return, so only the hitting hand grip will need to change. This tends to be a somewhat individual process for players. ►Volley and overhead: Volleys are movement shots. The pace of the ball hit is determined by how fast or slow one pushes off with the feet and legs, in combination with racket work. Therefore, a balanced and potentially powerful stance is key to a great volley. Recognition of which side of the body the ball is coming to determines the first move. The racket face and same side leg prepare together for a multi-directional push off to the ball. If you begin with a balanced and neutral stance and a Continental Grip, then going to the forehand or backhand are equally simple. ►Overheads require a great first move. There is some individuality in hitting an overhead depending upon the athletic ability and serve structure of the player. Typically, the first move combines several movements: Pivoting, turning and stepping back to the hitting side and raising the toss and hit arms and locking them into position for the hit. Movement is paramount for the Overhead so starting from a neutral and balanced ready position will allow a quick and safe start to the overhead movement. ►Forward split-step: Like the ready position, a forward split-step is commonly misunderstood, poorly executed and poorly taught. A forward split-step is a ready position created from movement and is typically done just before your opponent strikes the ball when approaching the net to volley. The forward split-step allows for ball recognition, decision-making, a change of direction and a correct first move to the volley or half-volley. If the ready position is the start to all shots and running or moving adds to the difficulty of shot success, then it only makes sense that a good form for the ready position will automatically improve the ability to make a well-timed and effective split-step. ►The ready position for lateral recovery movement and directional change: Lateral movement can, once again, be very misunderstood. It is used when returning from retrieving a ball that is any distance from you. If you are moving to a ball, you turn and run. If it is 10- to12-feet to the left or right, you will use lateral movement and a slightly adapted ready position to return towards the center. Your arms may be more relaxed to match the moving and flexed state of the legs (which allows movement). A lateral split-step is now used. This is very different from a forward split-step in many ways, but similar in one: You will produce a lateral split-step in order to stop and balance, allow for recognition of the incoming shot and make directional changes and transitions that are successful. Hopefully you are now convinced to explore your ready position. Better form and structure will give you more time to react to a ball physically and mentally, a quicker step to every first ball, smoother transitions, easier grip changes and more precise approaches to each ball. Your best shots will all be better with a great ready position and your game will improve dramatically. Lisa Dodson is the developer and owner of Servemaster, a USPTA Elite Professional and a former WTA world-ranked player. 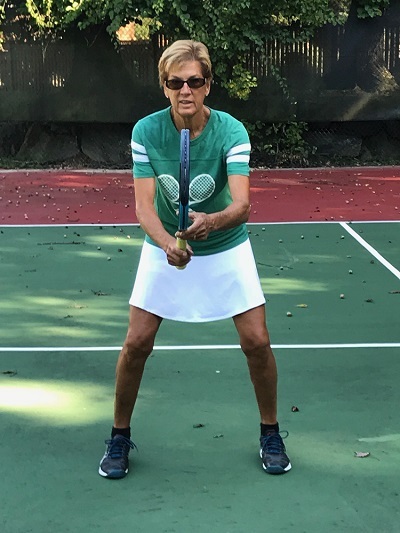 She is currently the director of tennis at Shenorock Shore Club in Rye, N.Y. She may be reached by e-mail at Lisa@TheTotalServe.com or visit TheTotalServe.com.